One of the companies in the frame as a potential buyer of Nokia’s Here mapping division has quietly inked a deal with the Finnish company to power mobile maps. 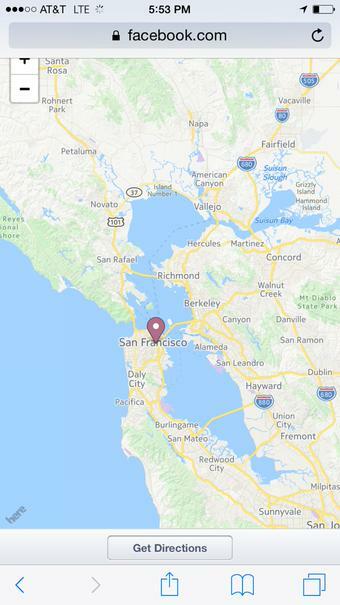 Facebook is now using Here maps for its mobile web version, and it is also running a test for Here to power location in native apps like Instagram and Messenger. “We’re excited that our maps can be enjoyed by Facebook users,” a Here spokesperson said. From what we can see, there are Here maps appearing in the apps, but from what we have been told by reliable sources, Facebook is also using Here geocoding. The geocoding provides a significant amount of specific place data to both Facebook and users when tagging a location in Instagram, Messenger or in the main Facebook app. While Facebook is not using Here maps currently in its native, flagship Facebook apps (on iOS for example these appear to be defaulting either to Apple iOS maps or Google Maps if you have the app installed on your device), if you visit Facebook’s mobile site through your browser and check out a map of a user’s location or that of a venue, you will see that there is a diagonal “here” logo in the bottom left-hand corner. Facebook revisiting its mapping options and updating its partnerships for these should surprise no one. First, having good location technology to tag where a person is helps Facebook be a richer service for its users who may want to update their status or post pictures from specific locations, especially considering how big a part mobile plays in Facebook’s business today. Second, there is a very commercial angle here, too. Businesses use Facebook as part of their advertising and marketing operations and offering ads based on specific locations, or other location-based services, gives Facebook more ways to build up their relationships (and revenues) with these business. Having better location data by way of Nokia is also logical for another reason. Facebook has long been making a play for having better location services, a strategy that you could argue has fuelled several acquisitions like Glancee, Tag Tile, Gowalla and Rel8tion to further its location technology and talent pool. And more recently, an update to Facebook’s notifications enabled users to look at nearby places along with updates from their network of friends. And yet, not all of Facebook’s forays to further its own location services platform have been met with massive success. Remember the fire and brimstone when Facebook first swapped out Foursquare with its own Facebook Places location database? That’s another reason why partnering with a bigger provider of geolocation data like Nokia Here makes sense. It’s not the first time that Facebook and Nokia have collaborated. Facebook is one of several social companies that feeds data into the Here maps. And years ago, well before Nokia sold its handset division to Microsoft and was still the world’s biggest handset maker, the two talked about collaborating on devices. The two have also worked on ways to better connect people in developing countries by way of Internet.org. On the other side, there are a number of other large companies already using Here maps, including Amazon, Yahoo, Microsoft on mobile and Baidu. One big question will be if Facebook doesn’t end up buying Here, what might happen to that relationship if someone else did?